To view our current inventory of antique British campaign medals, uniforms and accoutrements, click here! The Battle of Guadeloupe aboard HMS ROSAMOND! 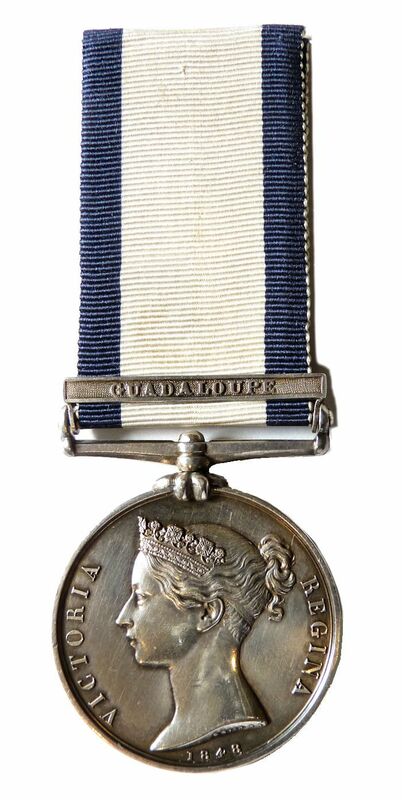 Presented is a very rare example of the British Naval General Service Medal (NGSM) with Guadeloupe clasp of which only 484 were known to have been issued. This makes this one of the rarest of medals of this type. Furthermore, the capture of Guadeloupe had a lasting impact on the British role in the eastern Caribbean for years to come. And, the ship in which the recipient served as a seaman was a small battle scarred veteran with two significant victories to her credit, before playing a role in the aforesaid capture. AWARD: This medal was awarded to William Mills , able bodied seaman, and dated 1848. Mills is listed on page 204 of the book, "The Naval General Service Roll 1793-1840" in HMS ROSAMOND. The medal is complete with its white ribbon with with blue boarders. MARKINGS: William MILLS on edge. W.Wyon, RA (Royal Academy) on the reverse in very small bas relief under the seahorse's tail. CONDITION: Super fine with a nice patina of age. Both sides of the ribbon are glued together, and there is evidence on the back of the ribion showing it was glued to something for display. HMS ROSAMOND: The ROSAMOND was launched in 1807 as a 5th rate sloop. She displaced 1059 tonnes, carrying 18 guns and was crewed by 160 officers and men. On 26 June 1807 she captured the Dutch privateer Amotellan of 12 guns and 60 men. On 17 December 1809 under Captain Benjamin Walker, off the island of Santa-Cruz, she captured the French 16 gun Corvette, Papillon. The Papillon mounted, like the rest of her class, 14 carronades, 24-pounders, and two sixes, with 30 troops, a crew of 110 men and boys; it had been 33 days from Bordeaux, and was carrying a cargo of flour to Guadaloupe. Being a fine brig of 343 tons, and only two years old, the Papillon was added to the British navy under the same name. In 1810, Rosamond served in the capture of Guadeloupe. After the battle, she was transferred to various assignments and stations in Canada, England and the Mediterranean until she was scrapped in 1815. PROVENANCE: From a private collection in the United States which aquired it from Spink, London in December, 1981, as from the Colonel Murray Collection, P.T.O. THE GUADELOUPE CAMPAIGN: The Invasion of Guadeloupe was a British amphibious operation fought between 28 January and 6 February 1810 over control of the Caribbean island of Guadeloupe during the Napoleonic Wars. The island was the final remaining French colony in the Americas, following the systematic invasion and capture of the others during 1809 by British forces. During the Napoleonic Wars, the French colonies had provided protected harbors for French privateers and warships, which could prey on the numerous British trade routes in the Caribbean, and then return to the colonies before British warships could react. In response, the British instituted a blockade of the islands, stationing ships off every port and seizing any vessel that tried to enter or leave. With trade and communication made dangerous by the British blockade squadrons, the economies and morale of the French colonies began to collapse, and in the summer of 1808 desperate messages were sent to France requesting aid. Despite repeated efforts, the French Navy failed to reinforce and resupply the garrison, as their ships were intercepted and defeated either in European waters or in the Caribbean itself. The British had intercepted a number of these messages, and launched a series of successful invasions during 1809, until Guadeloupe was the only French colony remaining. A British expeditionary force landed on 28 January 1810, and quickly over came limited resistance, and in a battle on February 3rd, defeated the French.The island's commander, Jean Augustin Ernouf, began surrender negotiations the following day. SYNOPSIS: No fewer than 230 different clasps for major battles, minor engagements, cutting-out operations and boat service from 1793 to 1840 were authorized for this medal. 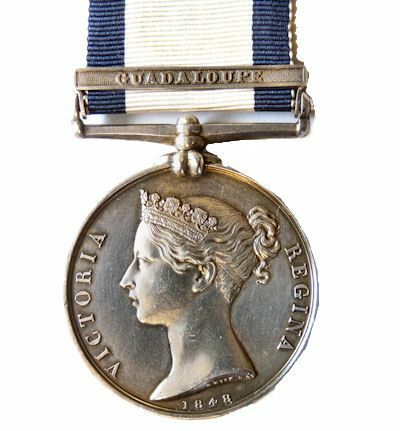 This is one of an estimated 484 Naval General Service Medals with the Guadeloupe clasp that the British Royal Navy awarded. Hence, it is one of the rarest. The rim of the silver medal is marked "WILLIAM MILLS". The white ribbon has dark blue edges. As stated it has the Guadeloupe clasp. According to the Rolls, William Mills was aboard HMS Rosamund as an Able Seaman. BACKGROUND: The French West Indian colonies during the Napoleonic Wars were almost completely cut off from France due to the British naval strategy of blockades: squadrons of British Royal Navy warships patrolled the coasts of both France, and the West Indian islands under French control. This hindered communications, severely restricted trade and prevented the reinforcement of the French garrisons during the conflict. As a result, the colonies began to suffer food shortages, their economies stagnated and public and military morale began to severely erode. In desperation, the commanders of the main colonies, the Leeward Islands of Martinique and Guadeloupe, sent a series of messages to France during the summer of 1808, entreating the French government to send food and military supplies. The French responded with a series of frigates and smaller vessels, sailing to the Caribbean. Some of these ships reached their destinations, but the majority were captured by the Royal Navy blockades. Those few ships that did safely make port were trapped there, unable to make the return journey without risking defeat by the British ships waiting offshore. The British decided to invade and capture the French West Indies before substantial reinforcements could arrive. During the winter of 1808, ships and troops from across the Caribbean were gathered off Barbados under the command of Vice-Admiral Sir Alexander Cochrane and Lieutenant General George Beckwith, with the intention of invading Martinique early in 1809. A smaller force was sent to Cayenne, which was invaded and captured in early January 1809. In late January, the invasion of Martinique began, and the island fell in 25 days. In April 1809, a strong French reinforcement squadron arrived at the Îles des Saintes, south of Guadeloupe. There they were blockaded until 14 April, when a British force under Major-General Frederick Maitland invaded and captured the islands. 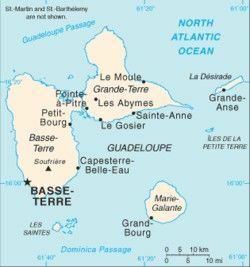 In the attempt to escape, the ship of the line Hautpoult was captured and two French frigates were trapped in Basse-Terre on Guadeloupe. In June, the frigates attempted to return to France. Only one of the frigates escaped the blockade squadron, although the escapee was also captured a month later in the North Atlantic. Subsequent French attempts to supply their one remaining colony on Guadeloupe were minor, most of the brigs sent were seized without reaching the island. The only significant attempt, launched in November 1809, achieved initial success in the destruction of the British frigate HMS Junon on 13 December, but ultimately failed when the two armed store ships, Loire and Seine were destroyed on 18 December in a battle with a British squadron off the southern coast of Guadeloupe. During the autumn and winter, British forces were collected from across the Caribbean at Fort Royal, Martinique, under Cochrane and Beckwith for the invasion of Guadeloupe. Credit Wikipedia for much of this with editing. 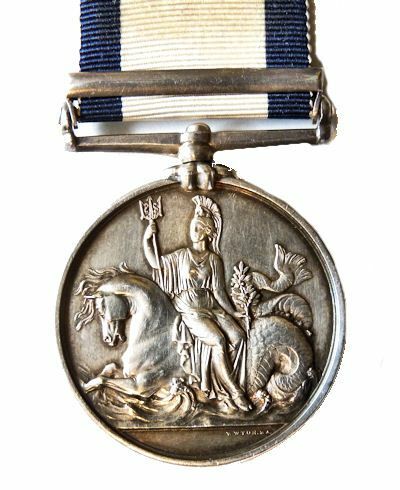 AWARD: This medal was awarded to William Mills, able bodied seaman, and dated 1848. Mills is listed on page 204 of the book, "The Naval General Service Roll 1793-1840" in HMS ROSAMOND. The medal is complete with its white ribbon with with blue boarders.